The next evening, when the Sabbath ended, Mary Magdalene and Salome and Mary the mother of James went out and purchased burial spices to put on Jesus’ body. In Jewish time keeping the end of the present day (& the beginning of the next) is at 6pm. This is why the Mary’s & Salome were able to go out (after 6pm) & buy spices, because at that time the Sabbath had ended, & the next day (Easter Sunday) was beginning. I have set this scene in the early evening. Light from some overhead lanterns illuminates the scene. You can see lantern highlights on the figures & objects, with shadows cast below & behind the figures & under objects. 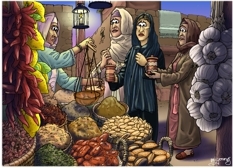 From left to right: A spice seller, Salome, Mary Magdalene and Mary (wife of Cleopas – Joseph & James Little’s mother – sister of Mary (mother of Jesus)). 01) (This page) Mark 16 – Resurrection of Jesus – Scene 01 – Buying spices (Night version). I have placed a blue overlay across this scene, to simulate night colouring. 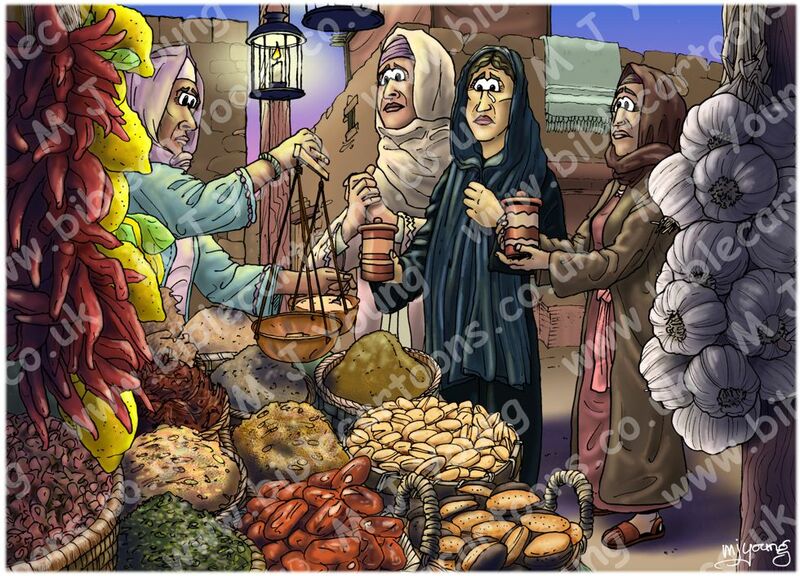 02) (Next page) Mark 16 – Resurrection of Jesus – Scene 01 – Buying spices (Colour version). In this version I have removed the blue overlay, so that full colour can be seen. Although I drew this scene after the Mark 16 – Resurrection of Jesus – Scene 03 – Angel one, the events in it occur before that scene, in terms of chronological order! Therefore I have had to be careful to include all the details of the three women that are in that later scene. For example the woman are buying 2 jars of spice, which I have had to make sure match the ones I drew in the Scene 03 – Angel picture. Continuity is very important to me! In the upper right foreground you can see garlic bulbs hanging up, whilst on the upper left are red peppers, with lemons behind them. Various baskets of herbs & spices are included on the stall. The lower centre foreground has a basket of dates in it, with almond nuts to the right, & a basket of Pistachio buts behind that. I enjoyed drawing & colouring up all these items for sale on the market stall!